Police made three arrests in connection with the robbery. Three people have been arrested in connection with an armed robbery in Derriaghy this morning. Officers were called to a shop on Milltown Avenue after robbers stole the till and made off in a silver coloured vehicle. Police teams quickly located and seized the suspect vehicle. A subsequent house search resulted in two arrests, with a third person being detained a short time later. All three suspects are currently in custody being interviewed by detectives. 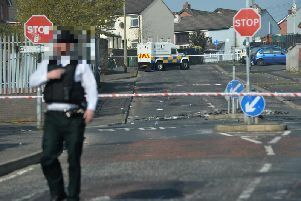 "If anyone was in the area of Milltown Avenue, Lisburn, today around the time of 0800 hours and saw anything suspicious please contact Police on 101 and quote reference 375, 23/09/2017," a PSNI spokesperson said.